As well as all the sports clubs on Tuesday - there are other after school clubs on Thursday. There is also a huge range of lunchtime clubs which I hope to feature in coming weeks. The school Fencing Club now has 28 members - after school on Mondays. Watch the video below to see the skills the children have learned already. year 5 children at Wednesday lunchtime computer club - using our new laptops. Our after school hockey club (Tuesdays 3.15-4.30pm) has been using the new astro-turf pitch (plus floodlights) at TMHS. There are 30 girls from years 4 to 6 being coached by Mr Brook, Mr Pope and Sarah Brook. The Friends are NOT issuing tickets in advance for Friday’s showing of ‘The Croods’. You will need to complete the yellow slip with the details of who is coming on the night and contact details if an adult is not staying and who is collecting. Please remember to BRING THE SLIP to the Film Night along with your payment. or by phone 07906 289 771. Help will be needed to set up, sell snack packs, supervision, sell tuck and clear up. DON’T FORGET a cushion to sit on, doors open at 5.30pm. This slideshow takes you through Class DB's assembly from last week. The slideshow is uploaded to a website called 'Slideshare'. It can then be copied onto a website or Blog. Viewers of your presentation do not need 'Powerpoint' to watch your presentation. Please note there will be NO NEWSLETTER for parents this week. Did you know you shouldn’t put carrier bags in the blue bins or that you should wash out plastic cartons? Do go along to this workshop run by Greener Fram to learn more about how to use your blue bins correctly, and have your questions answered. It will be held at the FAYAP Centre at Thomas Mills High School next Tuesday & refreshments will be available. Children from class KV/NS have made these window decorations. They show a series of Bible stories. 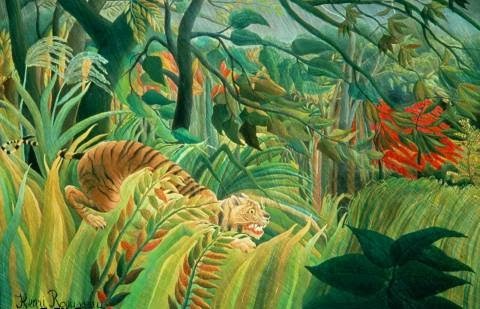 The children in both year 6 classes have been painting jungle scenes based on Rousseau's famous picture of 'A tiger in a tropical storm'. See the picture below - it is in the National Gallery we went to see the original picture during our trip to London last week. Click on it to see a fuller size version. Mr Byer has organised the annual KS2 chess tournament. The first round was held on Thursday lunchtime. 38 children have entered this year. We would like to give an advance reminder to all families that for World Book Day, we would like all children to come to school dressed as their favourite book character; we wanted to give children time to think of an idea for a costume. The Friends Film Night will now be on Friday 31 January, and they will be showing ‘The Croods’. Tickets will NOT be issued in advance but you must complete the slip on the Friends letter and bring it with you to the event. PLEASE NOTE: parents who receive letters by email will now also receive Friends booking letters by email too. The Parent Council have recently raised a concern over hot drinks (in takeaway cups) being brought onto the playground, into assemblies or church by parents. The parent council has the support of the school’s health & safety committee in requesting that NO HOT DRINKS should be brought onto the school site or church when children are present. Thank you for your co-operation. Framlingham College has been running a Multi-Sports afterschool club for pupils from our school for a number of terms now. This term they did not hand out forms for the children to sign up, however any children in Year 5 and 6 are welcome to attend these sessions. They run on WEDNESDAYS from 4.15-5.15 in the College SPORTS HALL. Please just turn up there this week for a trial or to sign your child into the club. We have decided to make a change to our Easter Service this year. Children in classes EM & JA will be leading this service to the whole school in the morning and then again to parents in the afternoon. Parents of these 2 classes are especially invited, but all parents/grandparents are welcome to come along to St Michael’s Church for this on Thursday 3 April at 1.30pm. Mrs Chapman, our cook, will be off until Easter following an operation. We are sure you would all like to wish her a speedy recovery. Mrs Aldred will be covering in her absence. If your child is interested in writing to a French Pen-Friend, then please see Miss Montague who has set up a link with a school in France. These will be handed to customers in Sainsbury’s between Wednesday 29 January and Tuesday 20 May and there will be a collection box outside the office. We have been asked by the school Nursing Team at the Saxmundham Clinic to let all parents know that their new telephone number is 01728 652393. There is an indoor charity Jumble sale in aid of the East Anglian Air Ambulance at the Framlingham Sports Club on Sunday 26 January between 10am – 2pm. There will be lots of bargain clothes, toys and bric-a-brac. Any items of clothing left over are being donated to our Bags2School collection on 27 February. Mills Meadow are holding a Coffee Afternoon, complete with raffle, games and stalls to raise money for Dementia UK on Monday 3rd March, from 2-4pm. It would be fantastic to have support from both inside and outside the home and to invite the community in! Please go along to support it and if you have any jumble, cakes or time to help please contact Roz Ingate 0333 321 8601 / roz.ingate@careuk.com - all contributions are greatly appreciated! Yesterday all 50 children from year 6 spent the day in London. They had a guided tour of Parliament (no pictures were allowed inside), a walking tour of some of the sites (the Abbey, Whitehall, Downing Street, Horseguards, The Mall, Buckingham Palace and lots of statues). The day finished with a chance to view some of the famous paintings in the National Gallery. We saw pictures by Van Gogh, Gainsborough, Constable, Turner, Rousseau, Monet, Leonardo, Stubbs and Holbein.